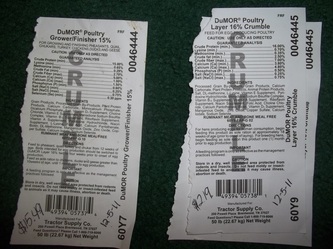 My Ducks, Chickens and Turkeys are currently on Nutrena Poultry Feeds. 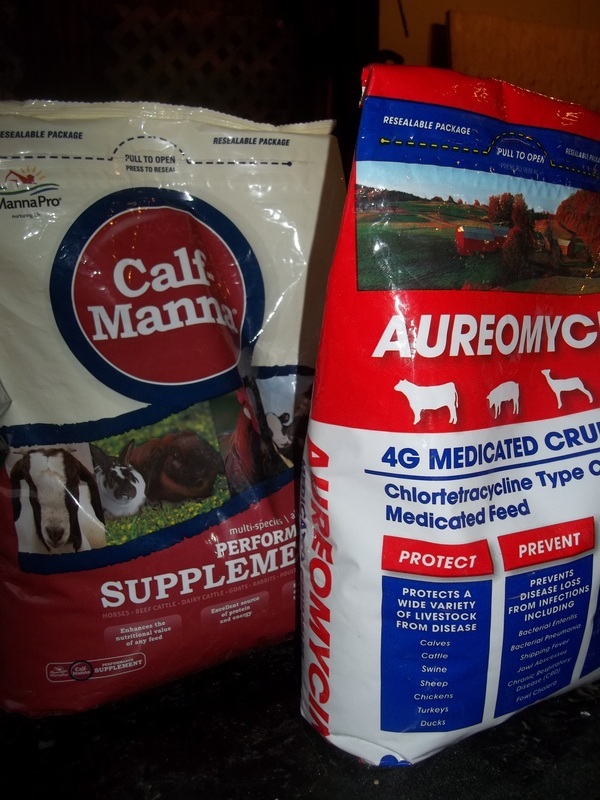 When it comes to your pets you should always try feed them healthy, high quality food. I also sometimes add a high quality cat kibble into their diet for breeding. 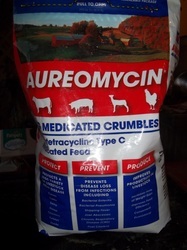 It is a good source of animal/meat protein. Cat kibbles are not recommended to be fed to Ducks and Chickens all the time. I usually only feed it to them when they are laying or when I'm breeding them. When laying ceases I stop adding cat kibble into their diet. My Ducks especially go crazy for cat kibble. They gobble it right up from my hand. 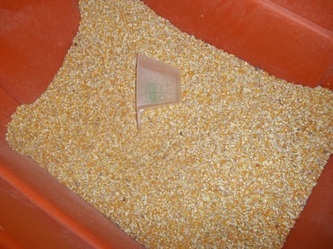 I feed my Ducks and Chickens their pelleted or crumbled formulated feed and I also feed oats. I do not add more than 25 % of oats to their daily diet. My Ducks and Chickens also graze when I'm chaperoning them. 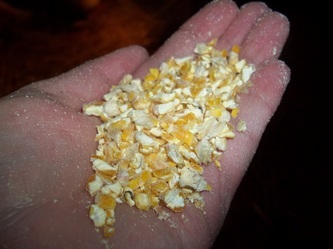 When my birds are not laying I switch them to a feed with lower calcium. When Hens are not laying their calcium requirements drop as do their protein requirements. What this means is if I were to use 4 cups of the game-bird feed I would use only 1 cup oats. 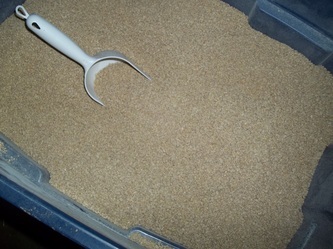 What this means if I were to use 3 buckets of the starter/grower feed I would only use one bucket of oats. You do not have to use cups. You use "parts". 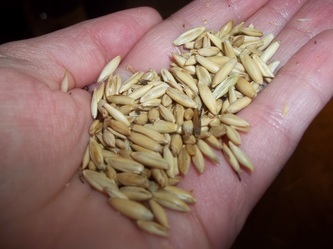 You could go 3 bags starter/grower to 1 bag of oats. That is what "parts" means. IF YOU ARE UNSURE OF USING GAME-BIRD FEED OR STARTER/GROWER FEEDS I HIGHLY RECOMMEND NURTRENA'S ALL FLOCK FOR NON LAYING BIRDS. THE CALCIUM LEVELS ARE JUST RIGHT. JUST ADD OATS AND YOU ARE SET. 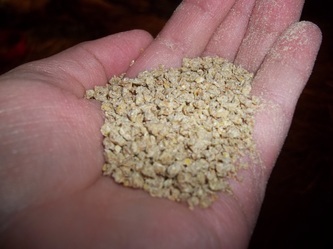 IF YOU ADD OATS TO THE WHOLE BAG of ALL FLOCK YOU NEED TO FIGURE OUT WHAT 5 to 25 % OF OATS IS FOR THE BAG. 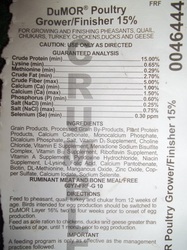 THE PROTEIN IS 18 % AND FOR DUCKS NOT LAYING THAT'S TOO MUCH PROTEIN--THE OATS WILL HELP WITH THAT. 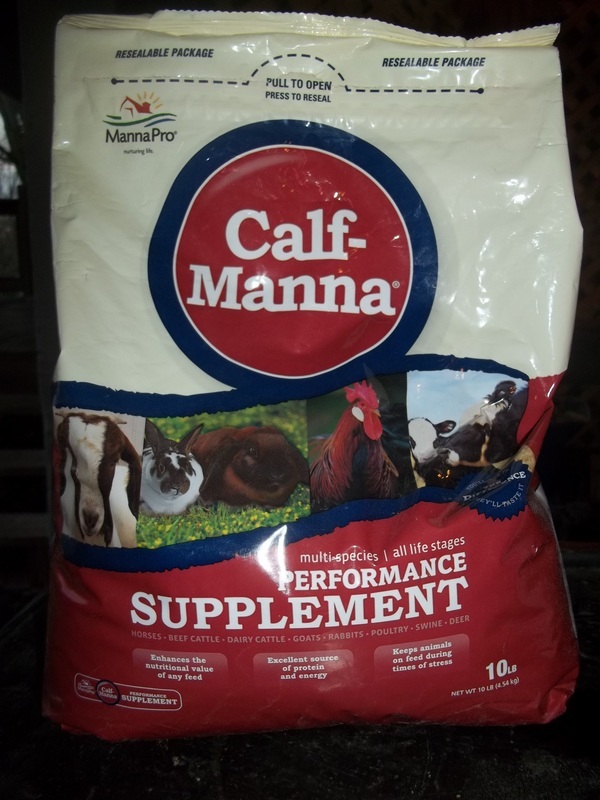 I feed Calf Manna to help give my birds a boost of nutrition during breeding season and when stress might be elevated particularly in hotter weather. It is a good quality product. Calf Manna has great ingredients-----no fillers or unwanted junk. Soybean meal, corn, hominy feed, feeding oatmeal, dried whey, dehydrated alfalfa meal, linseed meal, brewer's dried yeast, vegetable oil, fenugreek seed, anise oil, calcium carbonate, moncalcium phosphate, dicalcium phosphate, salt, sulfur, iron oxide, ferrous carbonate, ferrous sulfate, copper oxide, copper sulfate, maganous oxide, sodium selenite, cobalt carbonate, calcium iodine, vitamin a supplement, vitamin D3 supplement, vitamin E supplement, choline chloride, thiamine monoitrate, niacin supplement, riboflavin supplement, calcium pantothenate, pyridoxine hydrochloride, vitamin B12 supplement, folic acid, biotin, propionic acid. Look at all the good nutrient levels. I have noticed all my birds acting more active while on this. Great product. 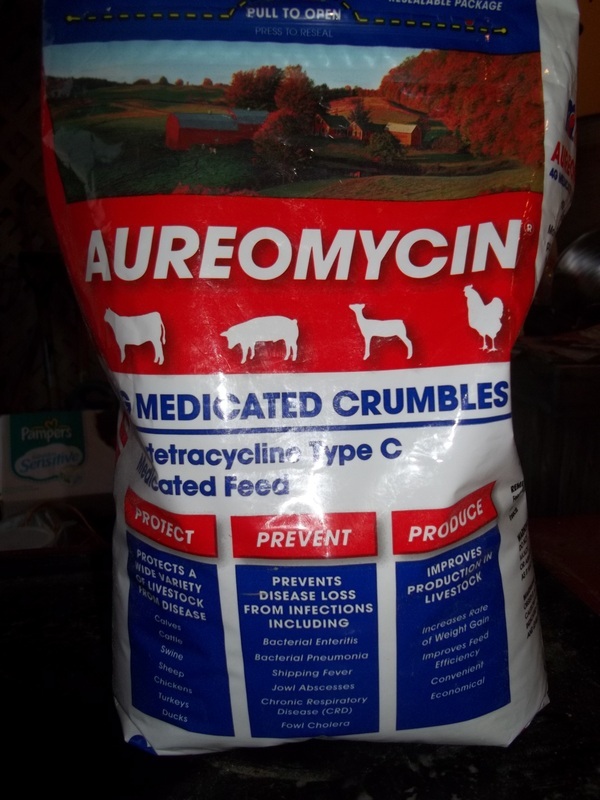 Protects against: bacterial enteritis, bacterial pneumonia, shipping fever, jowl abscesses, chronic respiratory disease and fowl cholera. 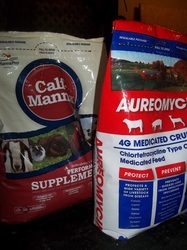 Manna Pro makes both of these products. 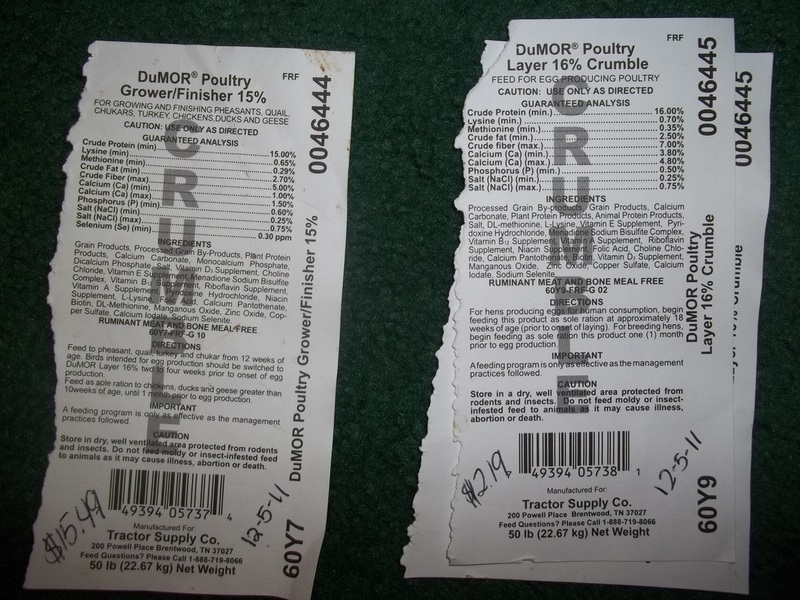 These feed labels are from DuMor manufactured exclusively for Tractor Supply Co. only. You can click on the photos below to make them bigger. 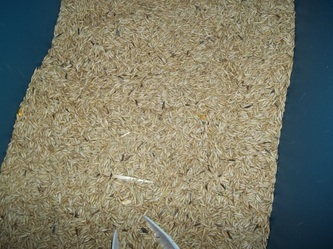 Oats (Start at 2-3 weeks of age and continue; only 5 to 25 % of daily diet. Oats help grow nice feathers. 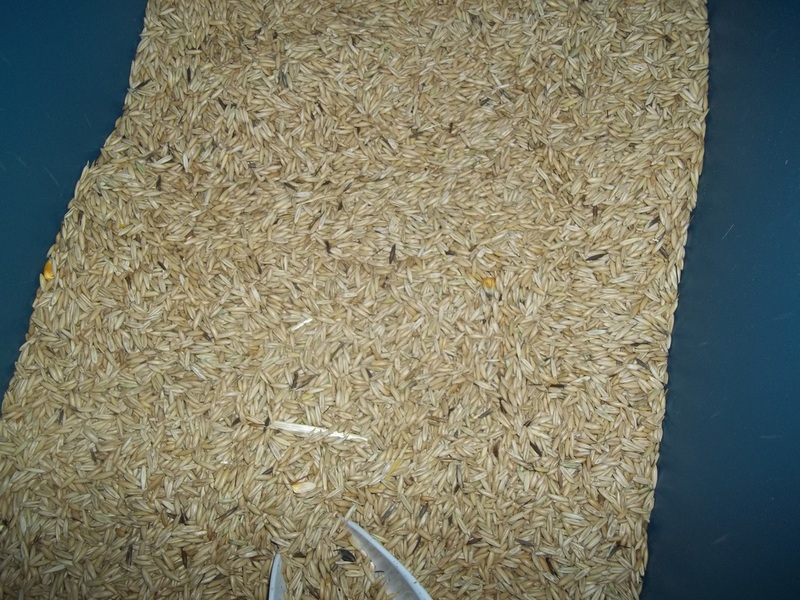 Birds fed oats have better feather quality, live longer, and produce more offspring.) I use quick oats for my little babies during their first weeks of life because it is easier for them to swallow and digest. And of course you want to make sure you add grit to the diet if they are eating any grains. 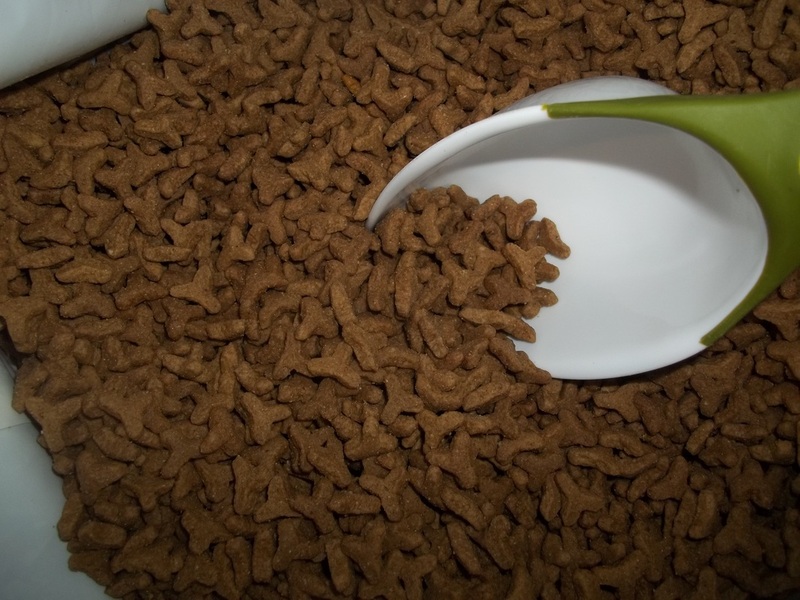 High Quality Cat Kibble (Can be fed to all ages of Ducks 3 weeks of age and up; feed no more than 10 to 15 % of daily diet. 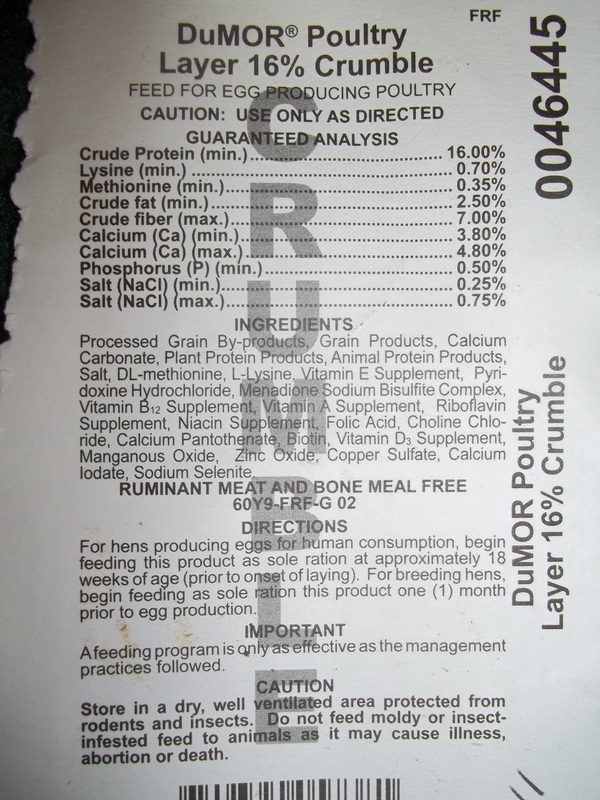 For Ducklings around 3 to 5 weeks of age limit to 5 % of daily diet and for a prolonged period of time. I only feed cat kibble when Ducks are laying. My boys enjoy the cat kibble just as much as the girls do.) 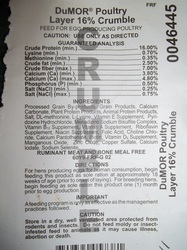 *Make sure that Ducklings (especially) do not choke on the kibble. The size should be appropriate for tier mouth. 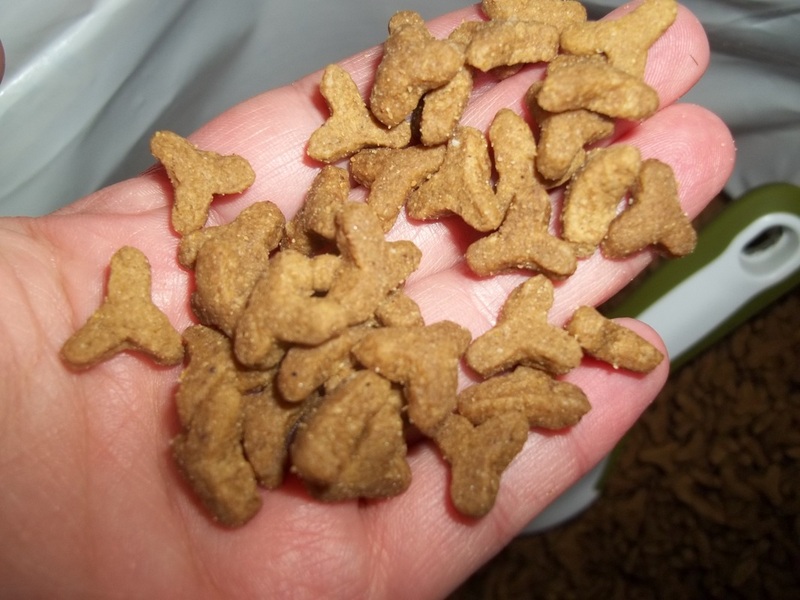 The size of cat kibble in my pictures would not be fed to Ducklings. 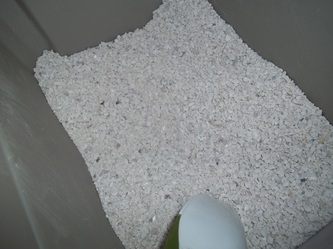 Oyster Shell (This is to be fed only to layers you have soft egg shells. 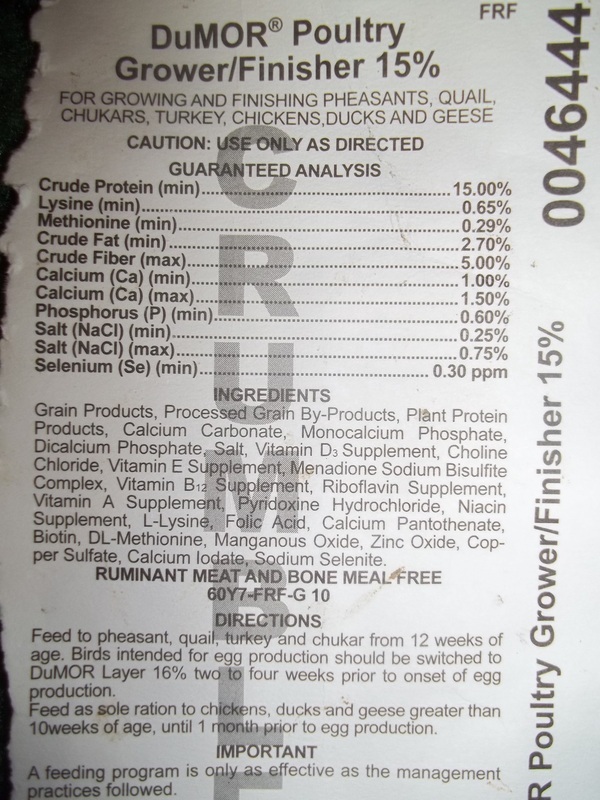 Growing birds should not eat this because they can overdose on calcium and die. It is not necessary for Adult Male Ducks to consume oyster shell but if they consume a little it won't hurt them. Just don't overdose! 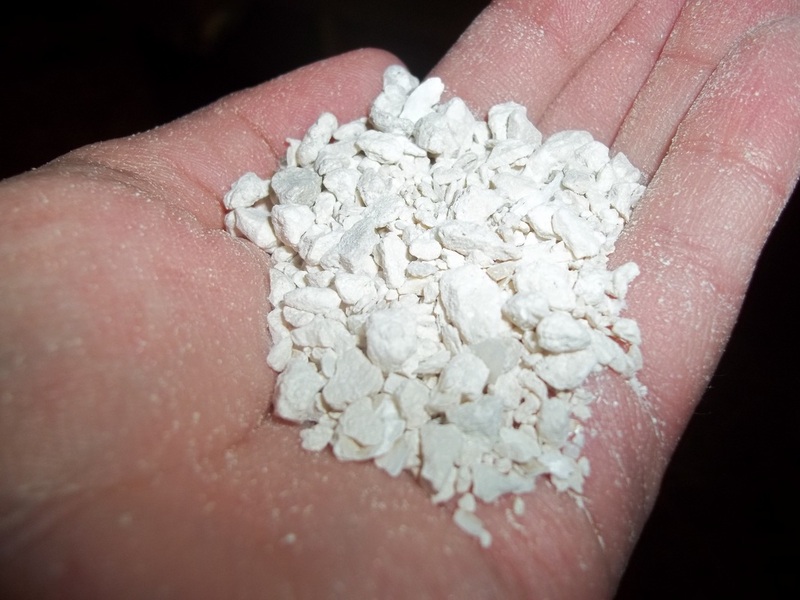 Oyster shell delivers calcium to the body 24 hours a day and cannot be used as a grit since it dissolves. I have both grit and oyster shell on hand, but that is only because I have both males and females. Oyster shell is only given to my girls if I notice egg shells being thin. You shouldn't really give them oyster shell in their mixed ration because they might overdose. If they need extra calcium and you provide a separate dish with oyster shell they'll eat it. The girls know if they need more calcium or not.